Hyundai Trajet PDF Workshop, Service and Repair manuals, Wiring Diagrams, Parts Catalogue, Fault codes free download!! 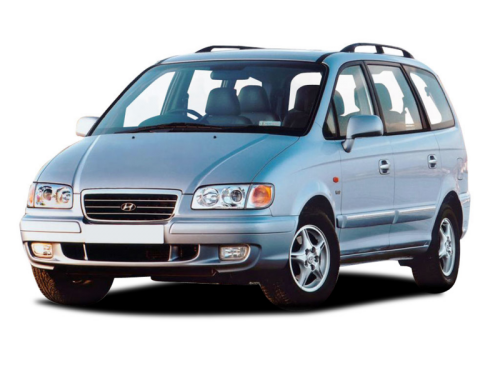 Hyundai Trajet – Hyundai 7-seater multi-purpose car. The presentation of the Hyundai Trajet took place in autumn 1999 in Frankfurt. Trajet is the first minivan from Hyundai. Produced at the plant in Ulsan (South Korea). The basis was extended (130 mm) platform platform Sonata IV. The name goes back to the French language and translates as “travel from one point to another”. The volume of the trunk is 525 dm³. The salon is transformable, seven seats are arranged in three rows, and each of them is equipped with an individual adjustment of the angle of inclination of the back, and the seats of the first two rows are adjusted and in the longitudinal direction. Any of the five rear seats can be rotated 180 degrees, folded or simply dismantled. The basic version (GL) is equipped with a complete electrical package, power steering, four airbags and roof rewings. The GLS version is distinguished by larger diameter discs and a wider list of custom-made equipment (ABS combined with electronic brake control system, air conditioner with two air conditioners, cruise control, leather interior, swivel front seats, rain sensor, dust filter in the salon ventilation system ). The engine in the Trajet is located transversely. Coupled with four-cylinder engines (2 liters) as standard, a 5-speed manual gearbox is installed, six-cylinder engines (2.7 liters) work only with automatic boxes. In 2001, a turbo diesel with direct injection of common-rail with a capacity of 110 hp was introduced. In early 2004, the Hyundai Trajet underwent facelift – the lighting technology and the radiator grille changed, the body-colored bumper and door handles were installed. For the average passenger in the rear seat added a three-point seat belt, there was an additional interior lighting, as well as an on-board computer. Also began equipping with a new 2-liter engine with a CVVT valve control system with a power of 140 hp. With this engine, the Trajet can accelerate to 183 km / h (vs. 179 km / h from the previous model). The car is equipped with two front airbags, at the request of the buyer it is possible to install side airbags. By rating Euro NCAP the car has received 3 “stars” for the driver and 1 “star” for pedestrians.